I have been following an interesting news of a match of Humans vs Tigers. The eventual outcome was a draw: one man and a tiger cub killed on each side. The story is that six men from Simpang Kiri village in Aceh Tamiang district went to the Mount Leuser National Park on Sumatra Island for harvesting agarwood (used in incense and perfume). I am assuming that this was probably illegal since national parks does have restricted entry and harvesting this precious material is probably regulated. Nonetheless, they set traps to catch deer (again, I am unsure about whether this amounts to poaching) and caught a Sumatran tiger (Panthera tigris sumatrae) cub instead (which eventually died). This action attracted 5-7 tigers in the vicinity who, quite notably, chased the men. The men climbed up some trees and hung on to dear life for five days, subsisting on rainwater. The tigers, equally persistent, remained at the base. One man was mauled to death when he fell down after a branch snapped. The others contacted nearby villagers via the cell phones. The villagers were helpless, but eventually "tamers" and the rescue team drove the tigers away. I could debate at length about whether the men deserved the plight they faced, but more interesting is the behaviour of the tigers. The Sumatran tiger is the smallest (75-140 kg - Prothero et al, 2012) and is critically endangered (Sunarto et al, 2013). It is endemic to, well, Sumatra and the population is around 350. The low numbers are due to deforestation and conversion of lands into acacia and oil palm plantations, fires, and poaching (O'Brien et al, 2003; Sunarto et al, 2012; Johnson, 2013) . This plight was recently highlighted by Sunarto et al, 2013, who calculated that numbers were much lower in the Riau province which was believed to have the highest concentration of tigers (Banerjee, 2012, state that the population had declined by 70%; from 640 in 1982, the numbers fell to 192 in 2007). 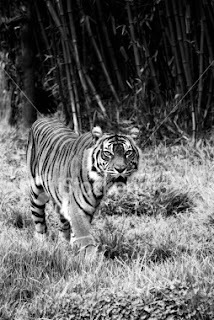 In a previous paper, the same authors proved that tigers are not particularly fond of plantations and settlements, preferring large contiguous and undisturbed forests and higher altitudes. However, the authors also encourage using the plantations as "corridors, stepping stones, or mosaics of connectivity facilitating animal movement"- which, in my humble opinion, is a recipe for disaster for both tigers and humans. Donald R. Prothero, Valerie J. Syverson, Kristina R. Raymond, Meena Madan, Sarah Molina, Ashley Fragomeni, Sylvana DeSantis, Anastasiya Sutyagina, Gina L. Gage, Size and shape stasis in late Pleistocene mammals and birds from Rancho La Brea during the Last Glacial–Interglacial cycle, Quaternary Science Reviews, Volume 56, 21 November 2012, Pages 1-10, ISSN 0277-3791, http://dx.doi.org/10.1016/j.quascirev.2012.08.015.